Plantar hyperhidrosis is the excessive sweating of the feet. It is usually more discreet and so less socially disturbing than palmar hyperhidrosis but just as bothersome for the affected people, and it can become a serious problem. Blisters and footwear spoiling is frequent. Sweat control measures, such as local formalin or antiperspirants, can be helpful in less severe cases. For unresponsive cases, the possibility of a lumbar sympathectomy (injury to the sympathetic chain, responsible for sweating) is available. 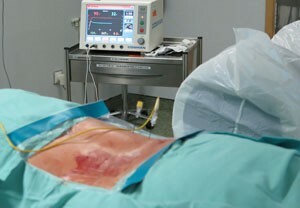 In most cases, percutaneous Radiofrequency lumbar sympathectomy is enough. It is an outpatient procedure so it does not require overnight stay in the hospital. 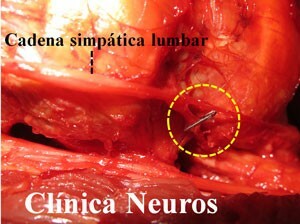 For more severe cases, endoscopic clipping of the lumbar sympathetic chain is available.